Hunting for vintage minor league singles is tricky for modern collectors. No man is an island, and as with Manuel Lunar, it's the guys around you that make the difference. The story of Manuel Lunar the Pitcher is straight-forward: he spent 3 years in Rookie League and single-A ball, walking more guys than he struck out and compiling a 8.78 ERA in 82 innings (career stats). In any 1980s major league set, he'd be easy to find for a nickel. 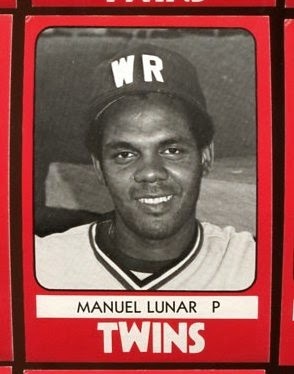 The story of Manuel Lunar the #5 Baseball Card is complicated by being teammates with these guys. Almost any Twins fan would love to add the Olivo / Gaetti / Hrbek trio to their collection. Demand remains high enough for this team set that finding Manuel Lunar would mean ponying up $70+ for all 27 Rapids pictured by TCMA that year. It's been 20+ years, so I'll just say "LOL" and stop there. Value: Singles could cost a few dollars, but rarely separate from their pricier team; as of this post, there's a set on eBay for $75. Fakes / reprints: TCMA reprinted several teams with stars (which might've included Gaetti and Hrbek) as "Collectors Kits" in the late 1980s. Those have black ink backs and originals have blue ink backs. "Well, We're Pitching Here in Allentown"